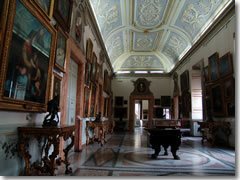 The Galleria Doria Pamphilj in Rome.Italy is just chock full o' history and art. It has enjoyed quite the prodigious output over the past 2.5 millennia, literally millions upon millions of paintings, frescoes, sculptures, decorative arts, and tapestries...And by the end of your vacation, you'll probably feel like you must have seen every last one of them. You'll visit ample amounts of ancient ruins, a multitude of medieval castles, gobs of Gothic churches, reams of Renaissance painting, a bevy of baroque palaces, numerous neoclassical sculptures, and miles of modern art, a panoply of creative effort spanning everything from Etruscan urns of the fifth century BC to the Ferraris of the 20th century. And there's a heck of a lot in between. It can get overwhelming, so take these few hints in your back pocket to help get the most out of these grand halls o’ great art without getting brain overload. Visit twice. Some museums are just too big to attempt in a day—the Vatican in Rome and Uffizi and Pitti Palace in Florence come to mind. If you have the time and the inclination (and don't mind re-paying admission), spread out the visit over several days. Split up. Nothing is so subjective as taste in art, and there’s no reason you and your companions need to stick together in museums and spend equal time perusing all the same paintings. If you part ways at the front door and set a time to meet, you can each go through at your own pace and look at whatever darn well pleases you. This strategy also gives you some time apart (even the closest of friends and family get on one another’s nerves after a while). Take the audio tour. The 1990s brought a wonderful revolution to museum visits. Almost gone are the ancient, stilted cassette audio guides that march every visitor in lock step from one masterpiece to the next. Nowadays, most audio “tours” are digital, often little wands that you hold like an elongated cellular phone. The works on display have numbers next to them, which you just punch into the wand’s keypad and it starts spewing out facts and background galore on the work, artist, era, and so on. When you tire of it, just hit stop and wander to the next painting. You go through at your own pace and hear only about what intrigues you. Brilliant. Know your art history. Art is much more interesting and engaging when you have some idea what you’re looking at. Just a little brushing up on major Italian artists and movements, whether you just skim your guidebook for it or take a course in art history before you embark on the trip, will enrich any museum-going experience. Draw cartoon balloons. Not on the paintings themselves. The guards take a pretty dim view of that sort of thing. I mean, put dialogue into the mouths of the figures on the canvas. Most of us get a little punchy after too many hours spent soberly contemplating creative genius. Feel free to make up stories to go with the scenes. Look for humorous details the artist painted in—any large canvas of a courtly scene or a banquet will feature things like a dog and monkey eyeing each other warily under the table, or two servants getting frisky with each other in the background. Know when the museum closes. Museums empty out in the later hours, especially the biggies that routinely stay open until 7 or 8pm (or, in a wonderful recent trend, in summer sometimes as late as 10pm or even midnight). If you plan to close the joint and are a fan of museum books and postcards, however, always check when the gift shop shuts its doors. For some idiotic reason, museum gift shops often close 30 minutes before the museum itself shuts the gates (at the Uffizi in Florence, even earlier), so drop in early if need be (or plan to return for your shopping). Look at what you like. In the end, art is supposed to be enjoyable, not a chore. There’s something liberating about going through a museum and just looking at the paintings, pausing at the ones that you find most visually intriguing and studying them, and moving on without ever even glancing at the little placard that tells the name of the artist, the title, and the background info. Enjoy the art for art's sake. I promise, there will be no test at the end.